Villa Lambros is situated on the northern coast of Crete, in Agios Konstantinos village, Roustika, near the town of Rethymnon and even closer to the sandy beaches of Episkopi. The house is surrounded by peaceful olive groves. It has no sea view. Yet we offer it because of its quiet location as a reasonably priced alternative. 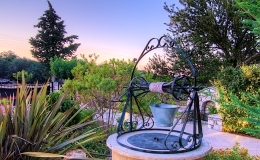 With its own swimming pool and garden it is ideal for a relaxing holiday in Crete.. 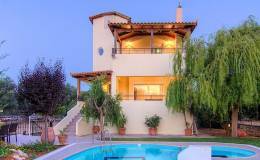 The villa is architecturally designed in modern Cretan style. Villa Lambros has 4 bedrooms, two bathrooms and is suitable for 7 Persons. Ground floor: Living room with fireplace and a veranda with dining area and breakfast bar separated by large fully equipped kitchen, satellite TV and DVD player. A spacious bedroom with shower. First floor: Three more bedrooms, one with double bed, one with single bed and a cot and one with a bunk bed for two adults or adult children. One bathroom. The bedrooms lead onto balconies or covered porches. Please ask for special prices for the season 2018, except July and August. || 10% Early Booking discount until 28-02-2018.